Product prices and availability are accurate as of 2019-04-09 15:12:42 EDT and are subject to change. Any price and availability information displayed on http://www.amazon.com/ at the time of purchase will apply to the purchase of this product. * Easy operation: just strip your wires, insert them into the connector and apply heat. For better result use heat gun. To control the temperature and heating time please rotate connector so that the solder melts before the shrinkable tube does. 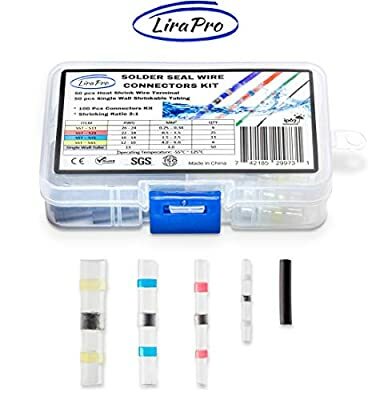 will increase current flow and ensure solid waterproof soldering connections every time! 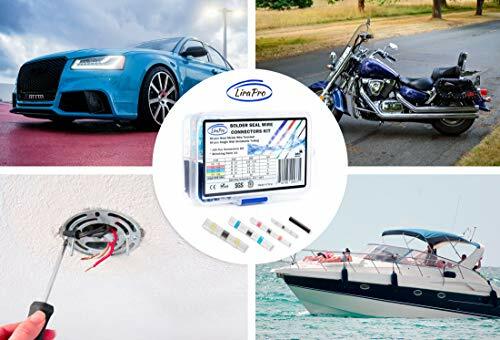 Everyone needs to have LiraPro waterproof wire connectors in their garage or shop! Please Note: Both sides of the connector may not be exactly the same size in diameter, one side slightly smaller than the other. That is normal, it's a production process. Connectors came in a storage box which can be reusable. Compliant with ROHS, ISO 9001:2008, SGS and CE standards. 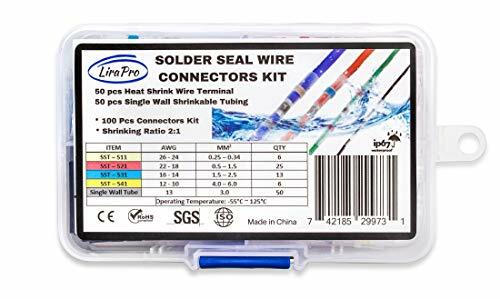 EXCELLENT WIRE CONNECTION SOLUTION FOR YOUR NEXT PROJECT - Simply position the stripped wires into the solder sleeve and apply heat to finish the connection. Make properly soldered and waterproof connections in less than 30 seconds. EFFORTLESS, FAST AND EASY SOLDERING PROCESS - It takes only one step to solder and seal connected wires. More convenient than the old conventional way. No need to crimp, just use a heat gun to get the job done. ABSOLUTE WATERPROOF - Insulation tubing has a unique dual-walled design: polyolefin tubing on the outside and hot melt adhesive inside. When heat is applied, polyolefin tubing reduces in size and adhesive flows inside the insulation. Dual walled tubing ensures waterproof seal and prevents wire corrosion. TRANSPARENT SLEEVE - See through sleeve provides precise inspection of striped wires inside for better control of soldering process. High elasticity assures steady performance. 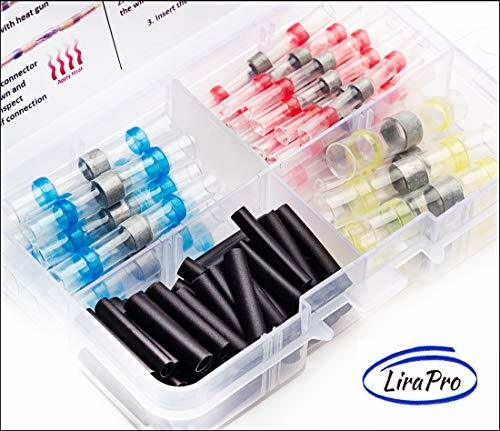 COST EFFECTIVE - Color-coded tubing with four different sizes make it easy to identify the right size of the connector for every application. Choose the right connector by looking at the wire size chart on the box. UNLIMITED APPLICATION - Application in areas such as automotive, motorcycles, watercraft, home and industrial electrical projects as well as electronics industries. Especially useful in hard to reach or limited space areas. 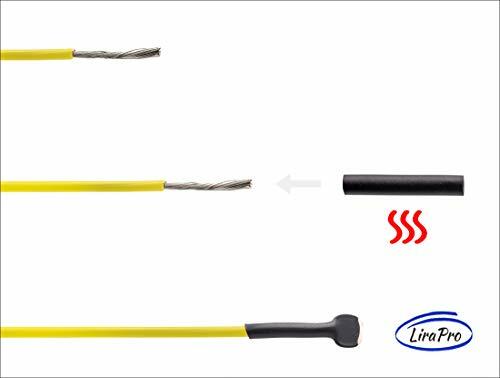 HERE'S A BONUS - Kit include 50 pcs x 20 mm long insulation heat shrink tubing cable wrap sleeves. Inner diameter 3.0 mm. Environmentally friendly, fast shrinking, flame retardant, soft and flexible tubing will make your wire connection rust/corrosion proof. 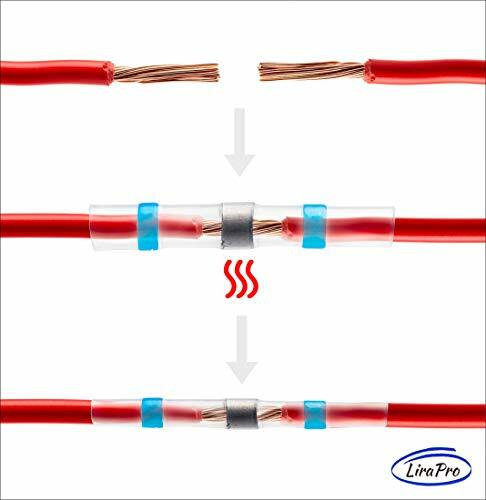 Will protect and insulate wire ends, wiring harness and electronic components. Excellent choice for protecting headphones and phone cables. 100% MONEY-BACK GUARANTEE - We stand behind the quality of our product. If for any reason you are not satisfied with your purchase, please contact us. We will work on every inquiry to ensure your satisfaction. Whole kit comes with 1 Year Warranty and Full Refund within 60 Days to ensure your pleasant shopping experience.